and instead chose to attack nascent Israel. Little has changed in the last 60 years. The Arabs (forever, doggedly anti-Semitic) are still attacking the Jewish State will ferocity. In the final and unblemished analysis--it is this tenacious anti-Semitism that has caused all the pain and suffering in the Middle East. And to believe otherwise is sheer delusion. If one party is serious about making peace with its neighbor, would they continually erase them from their maps? Well, that's exactly what the PA continues to do on PA TV...and this, one day after the Annapolis 'peace' conference. So, what was actually accomplished in MD? Bupkis! If the President would have read his mail, he would have saved the American tax payers wads of cash. Why? Because in his mailbox was a letter...as we mentioned on Nov. 21st, a unanimous decision came down on Nov. 17th, by The Higher Arab Monitoring Committee, to reject Israel's demand that the Palestinians recognize it as a "Jewish State", as a piece of the peace negotiations, and a formal letter was sent to the 'Quartet'...of which the president is a leader. Evidence that the old campaign was correct: 'Reading is fundamental'. This gathering of disingenuous Arab despots was truly an exercise in futility. So here's some sage advise for the next 'peace' summit: At the very least, make sure both parties believe the other exists. Mr. Bush: 'Yea' Or 'Nay'? According to PA President Abbas, in a private meeting ahead of the Annapolis conference, Bush promised the PA a palestinian state before he leaves office. Which would include the West Bank, eastern sections of Jerusalem, including the Temple Mount and the Western Wall. Now, President Bush insists he does not intend to negotiate personally the two-state peace he has pronounced as his vision. "The United States cannot impose our vision," the president claims. In order to keep the first statement, he must violate the second. Well, which is it? Mr. Bush, with all due respect...double speaking to the public, when your actions speak volumes of your true intentions, is folly. As a Christian, it would be best to heed Matthew 5:37: "But let your communication be, Yea, yea; Nay, nay: for whatsoever is more than these cometh of evil." Don't allow your integrity to be destroyed in order to please the PA...a group of people who have not kept their word in all of their existence...for history surely attests, that's a gamble you will lose. terrorist states, not developing them. But that is exactly what we are doing by zealously advocating for a Palestinian state. The ongoing tumult in Gaza (including daily rocket attacks on Israel) is a clear indication of what a Palestinian state would look like. Granting statehood to a horde that not only engages in terrorism, but stridently rejects Israel's right to exist is the pinnacle of irresponsibility. Israel: Are We Their Friend Or Foe? Knowing our history with our friends Israel, the question should never cross our minds: Are we friend or foe of the Jewish State? Well, considering the most recent behavior of our leadership, the answer would clearly be foe. The so-called 'peace' conference slated for November 27, 2007 (almost 60 years to the day after the vote on UN Resolution 181) in Annapolis, MD, will be the site of a calamity. Our leadership will attempt to strong-arm tiny Israel into giving up more of their land (and some strategic to their national security) to the very monsters who have been slaughtering their civilians since the rebirth of Israel in 1948. One must ask: Are these the actions of a friend? The land we have already pressured Israel into giving up to the 'palestinians' has been turned into a massive weapons depot aimed at innocent Israelis, with whom they ('palestinians') supposedly want to 'make nice'. The land surrender has resulted in more violence, not less. With that in mind, why are we pressuring Israel to give up even more land for this illusive peace? Isn't this illogical, at best? There can be no excuse for our egregious behavior. And this toward those whom a majority of the American people support and defend. Our leadership is now acting on its own and does not reflect or represent the true position of America. Annapolis will be the site of a calamity. One in which Israel's enemies will gather to dismember the tiny democracy...while we hold the Jewish State to the carving table. Friend of foe? You don't have to be a rocket scientist for this one. "Now therefore I do recommend and assign Thursday the 26th day of November next to be devoted by the People of these States to the service of that great and glorious Being, who is the beneficent Author of all the good that was, that is, or that will be — That we may then all unite in rendering unto him our sincere and humble thanks — for his kind care and protection of the People of this country previous to their becoming a Nation — for the signal and manifold mercies, and the favorable interpositions of his providence, which we experienced in the course and conclusion of the late war — for the great degree of tranquility, union, and plenty, which we have since enjoyed — for the peaceable and rational manner in which we have been enabled to establish constitutions of government for our safety and happiness, and particularly the national One now lately instituted, for the civil and religious liberty with which we are blessed, and the means we have of acquiring and diffusing useful knowledge; and in general for all the great and various favors which he hath been pleased to confer upon us. 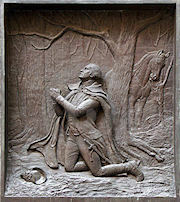 "And also that we may then unite in most humbly offering our prayers and supplications to the great Lord and Ruler of Nations and beseech him to pardon our national and other transgressions — to enable us all, whether in public or private stations, to perform our several and relative duties properly and punctually — to render our national government a blessing to all the People, by constantly being a government of wise, just, and constitutional laws, discreetly and faithfully executed and obeyed — to protect and guide all Sovereigns and Nations (especially such as have shewn kindness unto us) and to bless them with good government, peace, and concord — To promote the knowledge and practice of true religion and virtue, and the increase of science among them and Us — and generally to grant unto all mankind such a degree of temporal prosperity as he alone knows to be best. "Given under my hand at the City of New York the third day of October in the year of our Lord 1789. Jewish State? What Jewish State? Prior to the upcoming 'peace' conference in Annapolis, Israel Prime Minister Ehud Olmert announced that he expects the Palestinian Authority (PA) to finally acknowledge Israel's existence as a Jewish State. A unanimous decision came down on Nov. 17th, by The Higher Arab Monitoring Committee, to reject Israel's demand that the Palestinians recognize it as a "Jewish State", as a piece of the peace negotiations. The PA has also announced that they reject the Israeli demand. In other words, "Jewish State? What Jewish State?" The committee's meeting took place in Nazareth after the Hadash and the Israeli Communist parties insisted that an official stance against the Israeli demand be taken preceding the Annapolis conference. A formal letter on the issue is expected to be dispatched to the Israeli government, the Quartet, the Arab League and other related parties. Correct me if I'm wrong, but doesn't this negate a major element of this 'peace' conference, namely, Israel? The PA is demanding land from a country it does not believe exists? It wants recognition, but refuses to do the same for the country that has given them all but the kitchen sink in negotiations? I believe this conference has two underlying purposes: 1) To give President Bush and Sec. Rice a gold star (and an attempted legacy) for solving the Mideast problem. 2) To give the PA another excuse for a third intifada against innocent Jews. What our leaders should unequivocally state to the PA, and their ilk, is this bottom line: If the Jewish State doesn't exist, neither do you. Get it. Got it. Good. In a new report issued by Israeli parliamentarian Dr. Yuval Steinitz, Egypt is permitting Hamas operatives passage to Iran, where they are being instructed by Revolutionary Guard members in sundry terrorist activities, including the production of rockets and road-side bombs, as well as fundamental military training. This, of course, is profoundly disturbing given the fact that American largesse to Egypt is in the billions. Perhaps the time has come to reevaluate our relationship with a nation that gives transit to homicidal jihadists who slaughter innocents. speak out (concerning illegal immigration) are accused of engaging in discrimination. Consider the words of Rev. Samuel Rodriguez, president of the National Hispanic Christian Leadership Conference "It is time for reasonable Americans and the faith community to rise up and clearly state that while we all desire to protect our borders and apply the rule of law, we will not embrace the nativist and discriminatory rhetoric articulated under the guise of border protection." So, after shoveling through this load of liberal dung--what exactly is the reverend saying? If any American even dares to utter a word of disgust or disdain about the hordes of illegals violating our border he will we be labeled "nativist," and accused of using "discriminatory rhetoric." While Aunt Fanny and Uncle Mel are being strip-searched at airports around the nation, Hezbollah loyalists are busy collecting top secret intel from the FBI computer system...illegal Muslim immigrants with mid-level posts with the CIA. Nada Nadim Prouty, an illegal Lebanese woman who overstayed her visa, pled guilty to conspiracy charges (among myriad other charges) just a week after quitting her CIA position. She spent time searching FBI computers to gather info on what we know about Hezbollah activities. Now, if the CIA and FBI are attempting to reinvent themselves in the eyes of the American public, I think they need to change PR firms. The once brilliant agencies are looking as though they are replete with dunderheads. How much of a background check is necessary to find out that someone overstayed their visa? If this is a monumental feat, we're doomed. How many more Prouty's are lurking around our intel? Was the current disease of political correctness (PC), that has infected our federal gov't, the reason Ms. Prouty was not discovered before she did us harm? This is serious stuff. It's time to drop the PC facade, stop frisking Aunt Fanny and again focus on criminal profiling...the technique that has always served law enforcement well. Because if we don't...our pastime may become regular visits to the city morgue. What statement best summarizes a certain political party's virulent propensity to subvert and obstruct the Iraq war? That would be Senator Joe Lieberman's recent proclamation that "Even as evidence has mounted that General Patraeus' new counterinsurgency strategy is succeeding, Democrats have remained emotionally invested in a narrative of defeat and retreat in Iraq, reluctant to acknowledge the progress we are now achieving." It's been reported by DEBKAfile that US Secretary of State Condoleezza Rice has extended an offer of time on the conference floor at the Annapolis summit to the Syrian delegate, in order to allow him to press his case for Israel to return the Golan which Syria lost in the 1967 War. The Golan matter will even be integrated in the closing document. What the....? Is there a gas leak in the State Dept.? These bloodthirsty murderers in sheep's clothing should not be respected and honored, but condemned. If not for our friends Israel, at least in the memory of our fallen Marines...and out of respect for their families. Shame on Sec. Rice and on President Bush for even entertaining this idea, no less offering it to these villains. Here's praying for a modicum of lucidity to dawn upon our leaders...and a cancelled invite to Hezbollah's homies. On Thursday, the US Congress approved $155.5 million for production and development of Israel missile defense programs. In particular, the Arrow anti-ballistic missile system. The Arrow funding includes $37 million for US-Israel co-production of the Arrow long-range missile interceptor (can detect and track incoming missiles as far way as 500 km or 310.7 mi) and $61 million for further development, as well as another $37 million for the David's Sling project, meant to intercept enemy missiles with a range of between 70 and 280 km (174 mi). Israel unveiled the Iron Dome project in 2006, which is intended to defend against rockets and missiles with a range of up to 40 km (25 mi). The project was designed on the heels of the war in Lebanon, in which Hizbullah launched 4,500 rockets into the Jewish state. So, if the Muslim world is paying attention (especially Iran and the Twelver's*)...the US is still with Israel...so take heed: This arrow will get its target. *Twelver's are extremist Mohammedans that believe if the world is pushed into a little chaos, the lost hidden Imam of the past will return in the present as the 'Mahdi' and will bring global Mohammedanism and defeat the enemies of Allah, in particular, Jews & Christians. And it's no secret as to why the Islamic Republic is psychotically fixated on developing nukes: The Annihilation of Israel and America. what is the only viable solution? Strategic military strikes. Either we strike now--or we vanish in a mushroom cloud later. "The new human rights council was delivered by some who thought they were giving birth to a new baby, but they have given birth to a horrendous monster." This heinous world body continually disparages Israel...even after Gillerman was introduced to speak, a fire alarm forced the committee to evacuate to a shelter, hindering his speech. Not a coincidence, but rather another example of disrespecting the Jewish State. Gillerman stated that the Human Rights Council was responsible for a "ritualistic and virulent campaign" against Israel. And this is evidenced by hundreds of UN Resolutions passed against Israel and yet not a one condemning the PA attacks on innocent Israeli civilians (which continues as you read this). Gillerman, correct again, when he pointed out that the council's membership included countries whose human rights records fell "markedly below" the standards of the international community, and "who cannot genuinely serve as a beacon for human rights when their respective performances are so dismal and poor." Israel is unequivocally the UN's scapegoat. They [UN] appear to spend their time focusing on and blaming the tiny democracy, which stands in the midst of huge Islamic fiefdoms (immersed in Sharia law and misogyny). The PA's murderous activities are ignored. Only when tiny Israel attempts to protect itself, does the 'beast on the east river' roar. The US stands with its ally...let's pray others in the international body will wake up to this injustice...and remedy it. Al-Qaida operatives (according to British security service MI5) are plotting machinations against targets in the UK utilizing their newly trained (British) adolescent killers. Apparently, Britain's transcendent plan of diversification (mass Muslim immigration) has only managed to produce one thing: Terror teens. The success of the Surge can only be frustrated if those who fixate on defeat rise to power. Yes, if those who incessantly demand immediate withdrawal from Iraq and total capitulation to Islamofascism score an electoral victory in 2008. With AQI (al Quaeda in Iraq) in full disarray-- and the Anbar Awakening proliferating across Mesopotamia--the prospect of victory (for the first time) is tenable. But all of this will evaporate if those who preach defeatism and submission are triumphant. G-d help us if they are. The last bastion of safety for the Jew outside Israel is slowing turning sour. Are America's arms still open to the Jews? A recent survey done shows that 31% of Americans believe Jews are more loyal to Israel than America, and more than 25% of the American people believe Jews were responsible for the death of Christ. 'The 2007 Survey of American Attitudes Towards Jews in America', a countrywide phone survey of 2,000 American adults from October 6 through October 19, found that 15% of Americans, or virtually 35 million adults, maintain views about Jews that are "unquestionably anti-Semitic." It appears that the major, and world, media are accomplishing their job. The negative (and biased) reporting done on a daily basis when the Jewish State responds to terrorist attacks, combined with the intentional blindness to the murderous attempts and acts of the PA...are producing an environment conducive to another Holocaust. It's time for American supporters of Israel (and the Jewish people) to rise up and counter every and all lies and distortions regarding Israel. The tide can still turn if we act now. For those who have ears to hear, Wagner's music is again wafting through the air...are we listening? Oddly enough, if you search beyond the Islamo-propaganda and unabashed anti- Semitism/Zionism that pervades the Mideast --you will discover an astonishing truth: Arabs enjoy more freedom in Israel than anywhere in the Arab World. (which includes the right to vote, run for political office, join the military, health care, public education, etc.) they can also do something that is prohibited throughout the Arab World: Speak freely. Search beyond the shameless anti-Semitism, and you will discover this most astonishing truth. What do you call a nation that disseminates acerbic, anti-American propaganda--preaches anti-Semitism--produces bloodthirsty, kamikaze Islamofacists and finances terrorism worldwide?